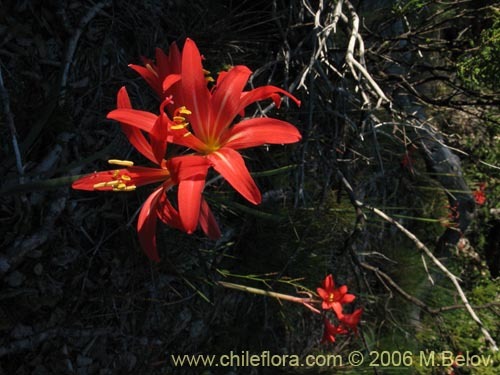 About 26 Rhodophiala in Chile and 21 in our data base. About 38 Amaryllidaceae in Chile and 30 in our data base. 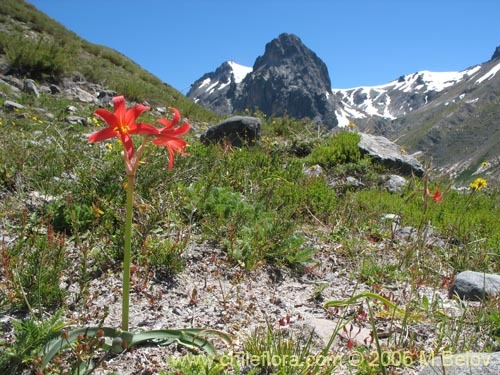 This is one of the most beatiful flowers of the Central Andes of Chile - it is big, and its brightly-colored flowers lightens up the barren slopes with red spots in the early spring, sometimes competing with the brightness of glistening snow, creating a truly otherwordly Alpine landscape. 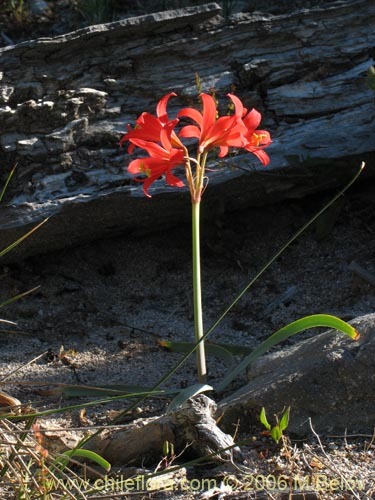 The flower presents itself with almost no leaves when it flourishes, which often heigthens even more the contrast with the surrounding - red flowers on bare stems on yellow sand, white snow, black stones, andnothing else. This is a perennial bulbous plant of about 30 - 40 cm. 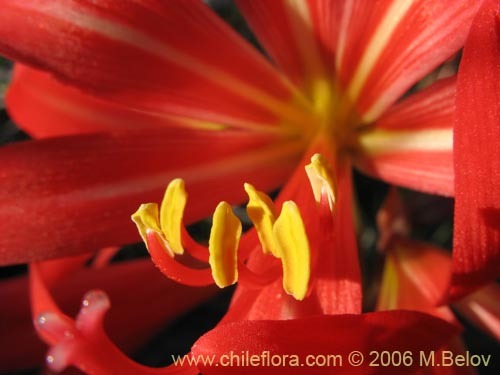 It has bright red flowers with the central part of the flower tinted with yellow stripes. The flower has six yellow stamens and one red pistil which is quite longer than the stamens, and the flowers come in groups of 2 - 4 on each stem. The leaves are absent during the flourishing. The leaves are linear and 20 - 40 cm long and about 1 cm wide. The seeds come in a three-parted greenish-brown capsule which contains about 20 - 40 black flat round seeds of 1 cm of diameter stacked up one on the other like pages of a book. The flowers appear in November - January, and the seeds are ripe in January and February. This plant gows at middle to high elevations in Central and Central-southern Chile, prefers sunny spots, but is also found in clearings in the forest, generally on sandy or rocky ground with good drainage. The soil on which it grows is generally richer in organic matter than is the case of other Rhodophialas. It needs a lot of water during its vegetative growth (in early spring), but during the flowering it can withstand dry spells of up to two months (the bulbs store nutrients and water necessary for flowering). It can be easily propaged by seeds or by division of bulbs. The seeds must be immersed in water for a day o two and then stratified in damp sand for a couple of weeks at 5 - 15 ºC. 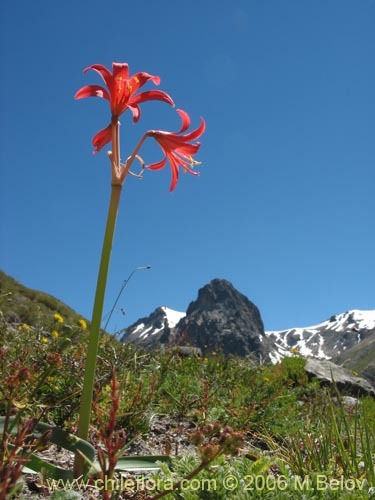 Since this plant grows well naturally at lower altitudes, it seems that the stratification may not be necessary. This is quite different from other species of Rhodophialas found at higher elevations (Rhodophiala rhodolirion, andicola, bakeri, and others) which would not germinate if not kept at 5ºC for at least forfour to six weeks. Then, the seeds are planted in warm sandy soil with some compost added (20ºC). Do not expect flowers for at least two seasons, because the bulb needs time to develop.